Team New Era is a world class participant at the MSBL World Series year after year. This New York contingent continues to go up the ladder of age divisions as the players move up in years while they keep excelling. One of the constants to their success is Dennis Gawronski. He has played in 12 World Series under the New Era banner, winning back to back titles in 2009 and 2010. For Dennis’ dedication and winning pedigree, MSBL Founder and President Steve Sigler has inducted Dennis into the 2017 class of the MSBL World Series Hall of Fame. “October is a special time for me at the World Series,” said Gawronski. “I play for New Era, the Rochester Red Wings and the ProBat Yankees in the Father/Son division.” Yes, his dance card is full. 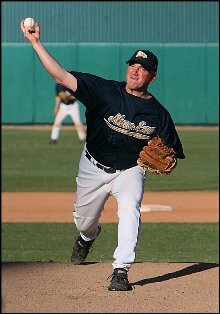 You can find Dennis on the bump at this year’s World Series or maybe roaming the outfield for Team New Era. He knows that his baseball journey to this point wasn’t achieved as a solo act. “I would like to personally thank the MSBL for the opportunity to play the game I loved since I was a little boy well into my adult years. Since I started going to the World Series in Arizona, I make it a point to tell everyone that I play with and against that they need to take the trip. It is an amazing experience.